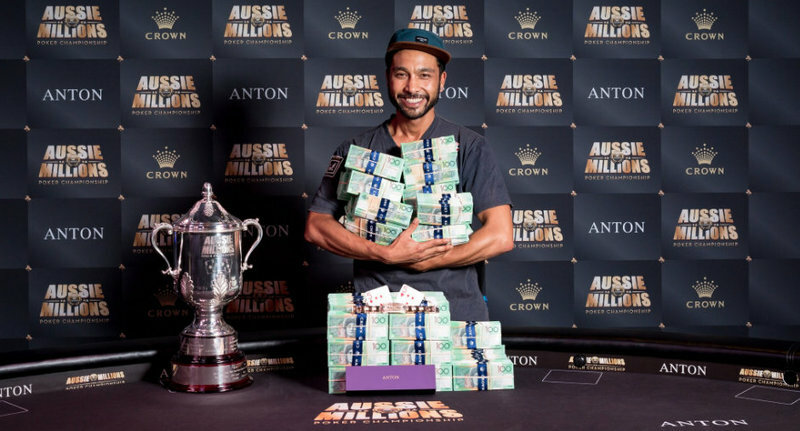 A week ago Shurane Vijayaram decided to try his hand in a $130 AUD rebuy event at the Crown Casino and ended up winning a seat in the 2017 Aussie Millions $10,000 AUD no-limit hold’em main event. The Melbourne local made the most of his seat, defeating a field of 725 entrants to capture the title and the first-place prize of $1,600,000 AUD ($1,209,760 USD). The was Vijayaram’s first recorded live tournament cash, as the amateur poker enthusiast usually plays in low stakes cash games or pub poker tournaments. His lifetime live earning literally went for $0 to over $1.2 million overnight. final table as the runaway chip leader. He was joined at the final table by a number of seasoned opponents including Jeff Rossiter, Ben Heath and Fedor Holz, who is fresh off winning more than $16 million in 2016 on the live tournament circuit. Holz was short stacked but able to survive to fifth place before being sent to the rail by Rossiter. Holz, who had finished in third place in the $100,000 super high roller just a day earlier for $266,293 USD, added another $253,294 USD to his earnings with this latest deep run. Vijayaram knocked out Rossiter in fourth place ($332,684 USD) to take a huge lead into three-handed play. He then sent Tobias Hausen to the rail in third place ($468,782 USD) to take roughly three-quarters of the chips in play into a heads-up showdown with Ben Heath. The final two played 29 hands of heads-up action, but the final showdown being the one to write home about. With blinds of 80,000 – 160,000 and an ante of 20,000 Vijayaram raised to 350,000 from the button. Heath made the call and the flop brought the 9 7 6 . Heath check-called a bet of 400,000 from Vijayaram and the turn brought the 3 . Heath checked again and Vijayaram cut out a bet of 500,000. Heath then exercised his option to check-raise, making it 1,390,000 to go. Vijayaram made the call and the Q hit the river. Heath moved all in for 3,200,000 and Vijayaram went deep into the tank. After roughly five minutes of consideration he opted to make the call with the 5 5 and was shown that Heath held only the K 8 for king high. With that incredible call Vijayaram secured the pot and the title, while Heath was sent to the rail as the runner-up. The British poker pro earned $1,000,000 AUD ($756,100 USD) for his strong showing.